Crusaders players celebrate after Jordan Forsythe scores from the distance. JORDAN Forsythe's audacious second half strike from the halfway line put the gloss on a comprehensive victory for Crusaders who stopped the rot at Brandywell Stadium. Three second half goals ensured the champions returned to winning ways after two straight defeats with the introduction of Jordan Owens from the bench at the interval proving instrumental against a 'Stute side who put the fight to the Shore Road men in the first half. The final scoreline was harsh on Institute who shaded the opening exchanges but found themselves behind to Rory Patterson's clinical strike on the half hour mark. Jamie McIntyre deservedly put 'Stute level seven minutes before the break with a stunning effort from 35 yards while Michael McCrudden also had a goal ruled out for offside much to the frustration of the home support. Crusaders' all-time top goalscorer, Owens made his presence felt 60 seconds into the second half when finding the net from close range. Crusaders striker, Jordan Owens celebrates his goal just seconds after coming off the bench. The Hatchet men began churning through the gears after that with two goals in the space of two minutes put an end to the contest. Skipper, Colin Coates bundled the ball into the net on 74 minutes before Forsythe produced that moment of magic from distance to inflict a fourth straight loss on league newcomers, 'Stute. Institute were unchanged from the team which lost to Glentoran last week but Stephen Baxter made three changes to the Crusaders team which lost to Dungannon Swifts midweek. David Cushley, Patterson and Jordan Forsythe came in at the expense of Philip Lowry, Michael Carville and Owens as the Crues attempted to arrest their poor run of form. The game suddenly sparked into life on seven minutes when Sean O'Neill produced an outstanding save to turn over Ronan Doherty's flicked header at the near post following a short corner. Straight up the other end Crusaders almost capitalised on a mistake by Jake Morrow who gifted possession to Cushley just inside the 18 yard box but Martin Gallagher parried away the shot. The visiting goalkeeper needed to be alert on nine minutes when 'Stute danger man, McCrudden found himself in behind the Crues defence through the middle but O'Neill saved at his feet. Howard Beverland brought down Jamie McIntyre 20 yards and from the resultant free-kick McCrudden's low, curling effort was gathered safely by O'Neill at his left hand post. 'Stute survived a real scare on 22 minutes when Patterson's close range strike was blocked but when the striker headed the second ball towards Cushley in space at the back post he volleyed into the side netting. McCrudden slotted the ball into the back of the net after Morrow found him with a pass towards the back post but the assistant referee raised his flag for offside. Almost immediately Crusaders broke the deadlock as Cushley found Patterson eight yards from goal and the striker's shot found the back of the net in off the post. 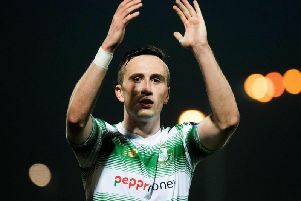 'Stute responded well and Aaron Harkin's free-kick was parried downwards by O'Neill before Crusaders cleared the danger. The home side deservedly got back on terms on 38 minutes when McIntrye let fly with a stunning strike from 35 yards which hit the inside of the post before nestling into the Crusaders net. Crusaders wasted a glorious chance to get back in front 60 seconds later when Heatley found Patterson in space but the ex-Northern Ireland striker blasted high over the bar from 10 yards. The home support were incensed when referee, Andrew Davey refused to award a free-kick right on the edge of the Crusaders penalty area after Beverland appeared to barge McCrudden to the ground on the stroke of half-time. Stephen Baxter made change at the interval with Cushley replaced by Owens and the bustling striker made an instant impact as he put Crusaders back into the driving seat. Heatley's audacious volley from 25 yards hit the crossbar but the rebound fell kindly to Owens who was left with the simple task of finding the net from close range. Heatley really should've added a third when he got onto the end of a punt upfield and in behind the 'Stute defence but volleyed harmlessly over on the hour mark. Owens headed agonisingly wide of the far post as he rose highest to get onto the end of Ross Clarke's cross from the right. Crusaders found the net for a third time on 74 minutes when Owens header across the face of goal found Heatley and his close range shot was blocked superbly by Gallagher. However, the rebound fell to Crues skipper, Coates who gleefully fired into the net. Forsythe then settled the match on 76 minutes when he spotted Gallagher off his line and sent his effort from the halfway line over the head of the 'Stute keeper and into the net. Owens downward header was then saved by the feet of Gallagher from point blank range but the game was all but over as the Seaview outfit returned to winning ways. Institute: M. Gallagher: R. Morrow (A. Jarvis 56) C. Bonner, D. Curry, C. McLaughlin; R. Wilso R. Doherty, A. Harkin, J. Morrow (D. Henderson 71), J. McIntyre (S. Curry 83), M. McCrudden; Subs Not Used - J. Dunne, S. Curry, M. Scoltock, G. Brown, R. Kelly. Crusaders: S. O'Neill: S. Ward, H. Beverland, C. Coates, M. McChrystal; D. Cushley (J. Owens h-t), J. Forsythe (M. Carville 83), M. Snoddy, P.Heatley; R. Clarke, R. Patterson (D. Caddell 72); Subs Not Used - H. Doherty, J. Glackin, D. Caddell, K. Owens, M. Ruddy.